I recommend adding a fork for university policies (like the policies at Harvard and 50+ other institutions) that obtain non-exclusive rights from faculty to make their future works OA. These policies take priority over subsequent publishing contracts, and allow green OA even for articles published in journals that don’t give their own standing permission for green OA. Another fork: some of these university policies give faculty a waiver option, letting them choose not to grant the institution non-exclusive rights for any given publication. 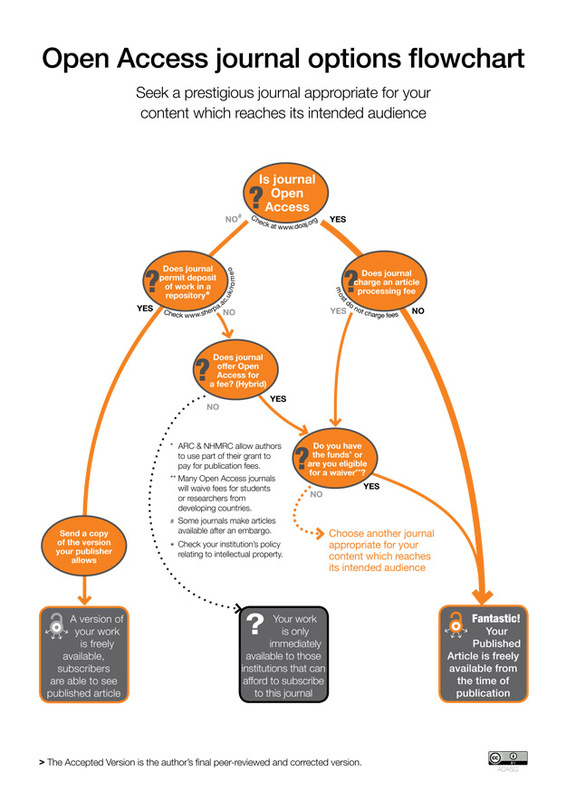 FYI: For my own (non-graphic) version of this flowchart, see [ http://bit.ly/how-oa ]. Thanks for the suggestion. Given the complexities associated with ensuring that all researchers are aware that they work at an institution which obtains non-exclusive rights, and the parallel need to keep the graphic relatively simple, we have compromised and placed an asterix that notes that researchers should check their institutional policy on intellectual policy.